Compare yourself against the bare bones requirements here. Is that you? Now check the ‘average student’ here. Still in the running? Even if it’s not you right now, could it be in four years? If so, you’re half way there. Know this is where you want to go. Research your options. A good checklist for comparing schools is available in the book, or create your own. Just do it so when you’ve made a decision, you know it’s right. Look at the long To Do list and understand they must be done. It includes not just becoming physically/mentally fit, but getting a Congressional nomination, passing a physical examination, working with the Blue and Gold officer, filling out piles of forms, possibly attending several sessions at the Academy to be sure you’re right. Accept that. It may interfere with other High School duties, but that’s the Academy way. They want to see how many balls you can juggle at once and still come out with applause. It’s doable and you can be that person. There’s a checklist in the workbook I used (Building a Midshipman) that makes it easy to complete everything, but be ready: It’s quite long. Make a resume. Yes, you’re young, but if you don’t start it now, you’ll forget that when you were in eighth grade, you won the Science Fair, and when you were a freshman, you were the #1 violinist at the area orchestra competition. There’s a sample in the book that can help you. Are you a mix of physical/mental/verbal? You don’t have to be the best in any one category, but a Navy Officer requires all three. You have to be physically fit, mentally sharp and able to communicate your thoughts and ideas. Some schools just want one or two. The Navy challenge: You must have all three. Keep trying. The Naval Academy values people who follow through even when they’re failing, even when there isn’t enough time (think about preparing for Pearl Harbor–did they have as much time as they needed), especially if it means working under pressure (like every battle America has ever been in). That ability to work through problems and stress is as important as the 4.0 and ASB President that Ivy Leagues want. Follow through. Once you’re in the application stage, send the information the Admissions Office requests, then follow through to be sure it got there. They have a handy update feature you can check or use the one in the workbook. Your goal is to be sure they think you’re in the same spot you think you are. Believe you can do it. Anything you can believe and conceive, you can achieve. 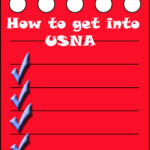 Set your GPS to ‘USNA’ and get going. 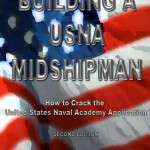 Jacqui Murray wrote Building a Midshipman, the story of her daughter’s journey from high school to United States Naval Academy. She is webmaster for six blogs, an Amazon Vine Voice book reviewer, a tech columnist for Examiner.com, Editorial Review Board member for ISTE’s Journal for Computing Teachers, Cisco guest blogger,IMS tech expert, and a weekly contributor to Write Anything. Currently, she’s editing a thriller for her agent that should be out to publishers this summer. Contact Jacqui at her writing office, WordDreams, or her tech lab, Ask a Tech Teacher. 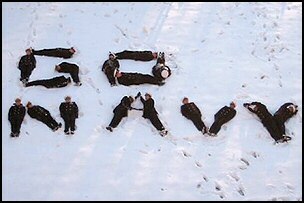 This entry was posted in USNA or Bust and tagged in college, scholarships, usna.